SHAH ALAM, Selangor–(BUSINESS WIRE)– As part of Alipay’s commitment to supporting digital innovation and talent cultivation in Southeast Asia, the Company today launched its Malaysia roadshow for the Alipay-NUS Enterprise Social Innovation Challenge (“ANSIC”). ANSIC is a joint initiative by Alipay, the world’s largest mobile and online payment platform operated by Ant Financial Services Group (“Ant Financial”), and NUS Enterprise, the entrepreneurial arm of the National University of Singapore (“NUS”). 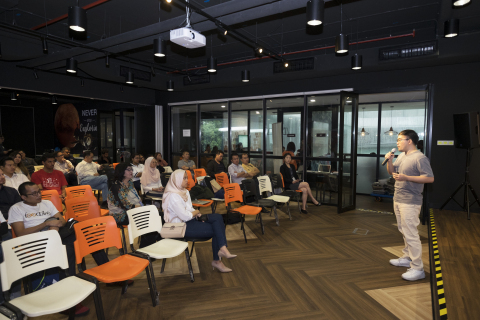 The roadshow was held at WORQ Subang in Shah Alam, Selangor, where Alipay shared its experience of how technology can be used to solve real world problems with start-up entrepreneurs in Asia. Alipay’s Senior Algorithm Engineer Xin Guo, explained to a crowd of Malaysian start-up entrepreneurs how he and his team developed the idea of using AI to make car damage claims more efficient for insurance companies, reduce costs and most importantly, increase convenience for car owners. On a rainy evening in September 2016, Xin Guo recalled being involved in a car accident that caused some minor damages to the vehicle. He then waited for 30 minutes for his insurance company to dispatch a claims adjuster, who had been delayed from handling other similar accidents. Despite the wait, it had ultimately, only taken a few minutes to file the claim. While the average waiting time for human claim adjusters to arrive at minor car accidents in China is 30 minutes, in congested cities such as Beijing and Shanghai, car owners may have to wait for hours. This unpleasant experience made Guo wonder: If AI could be used to automate this common process, wouldn’t that be a win-win for insurers and car owners? At Ant Financial, every team member is empowered to leverage the power of technology to solve real world problems. Guo pitched his idea to his superior and quickly obtained approval to start building a feasible solution from scratch, using the company’s resources. Using AI, machine learning and computer vision, Xin Guo and his team worked day and night to develop a technology service that became known as Dingsunbao, or “Loss Assessment Master”. In August 2017, after eight months of development and testing, the first official version of Dingsunbao was launched. The service allows car owners to upload images and videos of their damaged vehicles, and have their claims processed within seconds. Through technology, insurance companies are able to save significant resources by freeing up human claim adjusters to focus on more complicated accidents. Customer satisfaction also significantly improved. In China, it has been difficult for insurers to strike the right balance between operational costs and customer satisfaction. Most insurance companies barely break even or in fact lose money from their automobile insurance business due to labor costs and fierce competition. This has now changed with the introduction of Dingsunbao. As of May 2018, Dingsunbao helped insurance companies reduce their costs of claims handling by over RMB 1 billion, and saved claim adjusters 750,000 hours of time through the automation of the claims process. Xin Guo’s sharing session at the ANSIC roadshow sparked lively discussion from participating start-up entrepreneurs. Separately, Dr. Melissa Foo, VP of Social Innovation of Agensi Inovasi Malaysia, moderated a panel discussion entitled, “Running a Sustainable & Scalable Social Enterprise in Malaysia.” Panelists included Redza Shahid, CEO and co-founder of Grub Cycle, a social supermarket that is dedicated to reducing food waste and Suzanne Ling, co-founder of the Picha Project, a social enterprise providing sustainable catering services to help refugee families in Malaysia. The Malaysian roadshow is part of a series of events in Southeast Asia to help raise awareness of the Alipay-NUS Enterprise Social Innovation Challenge and to inspire new ideas and innovation in the region. In Malaysia, Ant Financial supports its partner Touch n’ Go with technological capabilities and experience in implementing a mobile payment platform to offer innovative payment solutions and other inclusive financial services. For more information on the Challenge, please visit www.alipaynusseachallenge.com. The inaugural Alipay-NUS Enterprise Social Innovation Challenge is taking place in Singapore, Malaysia and Indonesia. Applicants can participate by registering online at www.alipaynusseachallenge.com. Applications will close in January 2019. The first round of judging will determine the top three winners within each country, who will each receive a cash prize of SGD $10,000. The nine finalists will compete for the top cash prize of SGD $50,000 in the grand finale, to be held in Singapore in March 2019. A series of workshops and roadshows have been held in Singapore, Malaysia and Indonesia, to build awareness of the challenge, encourage applications and support further growth for the participating teams. In addition, the winners will become eligible for the 10×1000 Tech for Inclusion programme jointly provided by International Financial Corporation (“IFC”), a member of the World Bank Group, and Alipay. The comprehensive training programme will support the cultivation of 1,000 technology experts in emerging markets from both public and private sectors over the next 10 years. There will also be potential opportunities to work with Ant Financial and Alipay on CSR initiatives.